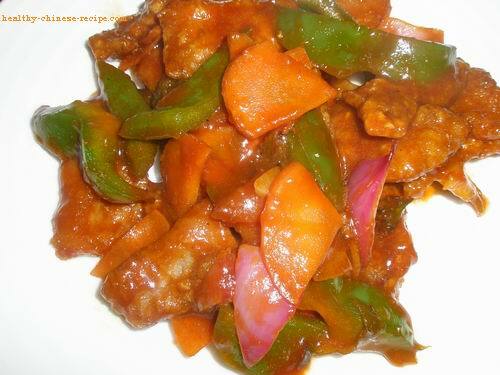 This Sweet and Sour Pork recipe is not cooked by deep frying which is regarded as unhealthy. It's made by baked coated pork blocks, same crispy, same delicious! No cooking oil at all! 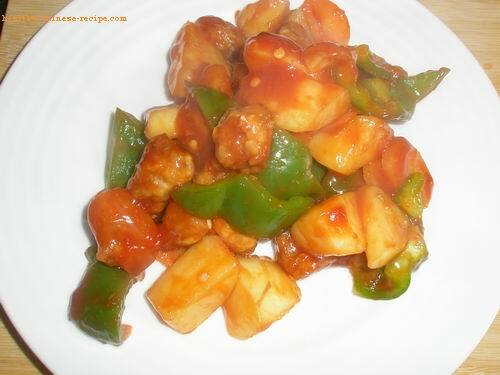 This is the perfect solution for those who love Sweet and Sour Pork but want to eat healthy! 1. Cut pork into bite size cubes. Marinate in Marinade Sauce over night. 2. Cut carrot, green bell pepper and apple into bite size cubes (better diamond shape). Set aside. Coat with dry cornstarch; Coat a layer of crumbs. 4. Arrange coated meat on a baking tray. Put the tray into the oven. Set the temperature to 210C（410F). Bake uncovered for 10 to 15mins. 5. Mix Sweet and Sour Sauce well. Mix water cornstarch well. 6. Heat wok. Stir green bell pepper, carrot chips, and apple cubes in Sweet and Sour Sauce. 7. Add Water Cornstarch, stir fry till a little thicken. Add pork cubes, stir fry till totally coated and thicken. 9. Pour in a plate, serve warm. 1. No cooking oil in this dish. 2. Don't stir fry pork long time. Put pork cubes when the juice almost dry. 3. If you like to eat crispy vegetables, you can put bell pepper and apple in the wok together with pork. (avoid over cooked). If you cut pork into thin flakes it becomes Guo Bao Rou(锅包肉，see below picture), which is Sweet and Sour Pork from Norheast of China. It's especially for ladies as the meat is thin. (women eat less meat than that of men).